Can't stop riding these tires. I purchased these tires for all-day epics on service 'roads' and jeep trails in the mountains outside of Portland. As usually happens around June, I swap the road slicks on my cross bike for some burlier tires. And just like that the Vittoria Adventure tire showed up on the site right around the time I wanted to procure some new back country tires. Tubeless setup was a breeze on my UST rated rims. So far, I can't believe how much faster these are on the road than the Clement MSO, the WTB Nano. The only tire rivaling this one's speed on the road is the Challenge Gravel Grinder, but that tire is flimsy as all getup (lots and lots of puncture). Once I take them offroad, they're plenty grippy even on dry to loamy singletrack dirt. On service roads I have plenty of confidence on rocky descents and the brake traction is exceptional. 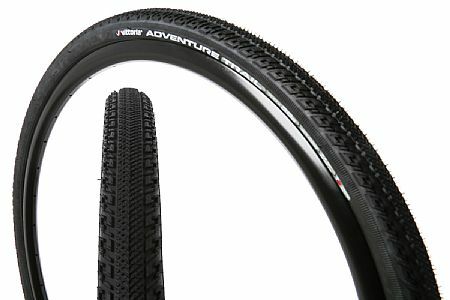 If your'e looking for an adventure tire (and your bike clears 40mm tires), look no further. Outstanding choice for mixed riding on pavement and trail alike! Outfitted my 2005 Trek 7500FX to ride the GAP (Great Allegheny Passage) and C&O Canal trails solo & self-contained in August. Hit the C&O trail the day after VERY heavy rains the night before and the tires performed perfectly through mud, grass, standing water, you name it. Road the Greenbrier River Trail fully-loaded a few weeks later with no tire-related issues. Very comfortable ride fully-loaded and continues to do well back home on daily commutes to work that includes pavement and packed dirtlimestone rail trail. One flat in 1500 or so miles and that was caused by a small piece of glass I failed to dig out before it finally cut its way through the layers to prick the tube (VERY slow leak). My go-to tire now for mixed riding on pavement and trail. Great backcountryjeeproadgravel blah blah tire-the BEST!